Choose the Heli 18 Ton Diesel Forklift when your lifting needs require better support. Depending on your requirement and budget, you also have various options available, starting from a 14 Ton version. With reduced turning radius and improved operator comfort, they come equipped with the Isuzu 6 BG1 engine, which is Made in Japan. The Shimadzu Hydraulic Pumps are also Made In Japan. Faster hydraulics, lowered hydraulic oil operating temperature, better fuel economy, improved hydraulic and engine cooling system, all add up to the offering. Fork Shift and Side Shift come as standard. This internal counterbalanced forklift truck is best suited for warehousing, logistics, foods, chemicals, paints, beverages, mineral water, oil & gas, fruits & vegetable industries and businesses. 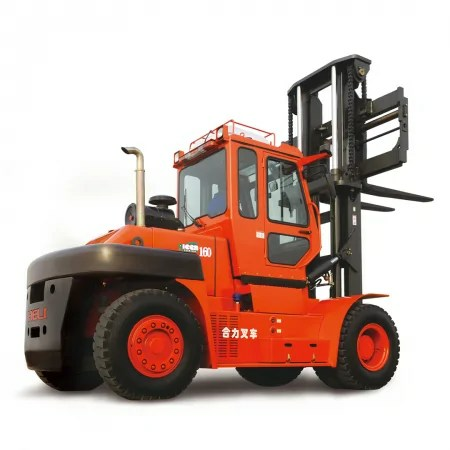 Give us a call and we can help with choosing the ideal Diesel Forklift that is suited for your requirements and your budget.